I am wearing the costume involving being on dry walling stilts and having the rest of the costume surrounding me. The idea behind this costume comes from a costume contest that I lost last year (Halloween 2016) to a guy dressed up like a Transformer. I had made a costume based off of a show from Netflix, but I realized I could up my game this year. My ideas for this year were based off a few key principles I learned from losing last year. The first and most important: Be tall. When you walk into a room and there is someone on stilts, you have to look at them. You can’t ignore that person. Second: you want to be noticeable: Bright colors or being bulky are attention grabbers. I think there is an expression about a radioactive elephant in a room…or something like that. Lastly: You have to look cool. The transformer did all three of these: stilts, bright colors, and lights. With these three principles in mind, I spent the next few months following last year's defeat thinking about what my 2017 costume was going to be. Some ideas only met of a couple of the criteria. Others, met all three, but lacked creativity, for example, maybe I should build a costume that looks like a Transformer? One day I was thinking about the shows that I watched as a kid and the idea came to me, Krang’s Android from Teenage Mutant Ninja Turtles. My first step to building Krang's Android was getting the proportions correct. 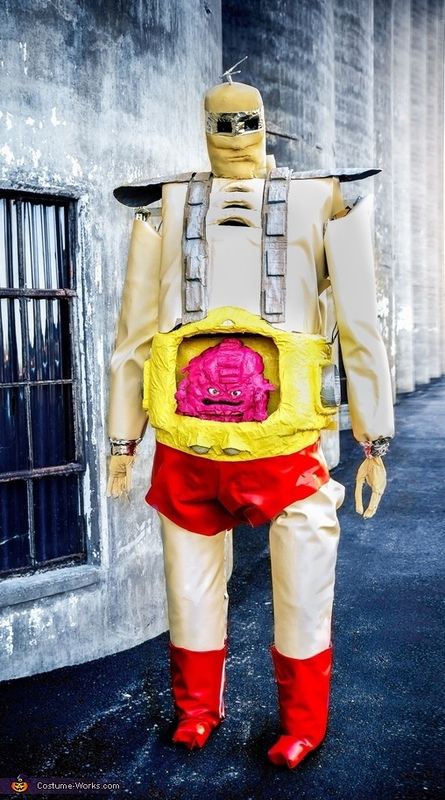 I found a full body image of Krang’s Android and broke it down into parts, leg length, torso length, etc. I measured each part of the image. Next, I determined that the final costume would be around eight feet tall. I used ratios between the measurements of the image and the overall size that each part should be, and created real world sizing measurements for each of the costume’s components. After I had the measurements, the next step was to gather supplies and build a skeleton or frame. I bought dry walling stilts online (about $85) that fit the sizing measurements and I built a frame out of aluminum bars and corner supports. The Android’s torso would be built around this aluminum frame. Next, I used reach extenders that I got from the dollar store and additional aluminum bars to build the skeleton of the arms. To get movement of the shoulder I bought some replacement dresser wheels from the hardware store. These wheels were used because in addition to turning on their axel, the wheels could spin around a full 360 degrees, due to ball bearings that were built into the wheel’s housing. I drilled screws through the aluminum bars into the wheels on each side and attached the wheels to the larger frame. Now the costume’s skeleton was complete. I knew that the costume would be heavy and it would be nice to take the weight off of me, so I built extension bars running up from the stilts. These extension bars would let me take the weight of the costume and set it right onto the stilt. I used hinges wired with springs at the connection point between the extension bars and the stilt as a joint. This joint allowed the extension bar to bend when I walked, avoiding any hindrance in my mobility. The spring then pulled the joint straight when I was not moving, which allowed for the weight to be set upon the extension bar. The body of the Android was next. I used a similar process to build the torso, legs, arms, and head. All of these components used a chicken wire frame, first wrapped in masking tape, then covered with two to three layers of burlap saturated with glue. The pieces are then left to dry with a fan blowing on them for several daysI removed the wire frames and as much of the tape as I could from the burlap pieces after they dried. I powered the lights with a 12volt Lipo Battery. I calculated the amount of LED’s I could run off of the battery using the forward voltage of the LED’s. This calculation also told me what type of resistors were needed. Next, I drilled holes into the costume’s frame, soldered the LEDs to wires, and wrapped them in electrical tape. Then I pushed the LEDs through the holes I drilled and encased the wires inside of electrical tubing. I ran all the wires, as a parallel circuit, back to a control box that I cut slots in the front of to make room for switches. I pushed the switches through the slots, soldered the wires to the switches, and ran the exiting wires back to the Lipo battery pack. I then attached the control box to the inside of the costume, so I could turn all the lights on separately or, using a master switch, turn them all on at the same time. Lighting was done! Next, the making of Krang. Krang needed to look flesh like. I wanted him to be light and if possible moveable. I bought some high density foam from a craft store and hot glued it together until I had a 12” by 12” block. Next, I carved the foam using a box cutter blade. It was slow going, but surprisingly foam is very mutable. I then hot glued the extra projections coming from Krang’s head. Krang’s arms and mouth were the next task. The construction of Krang needed to be flexible enough to allow for servo motors to move him. Foam is very light weight, but does not support any real structure. So it worked as an outer covering, but I needed to build a skeleton inside the foam to attach to the servo motors. I built the skeleton out of pop sickle sticks and bolts. Each segment of Krang’s arms were made from four sticks glued together with gaps on the ends to allow for the next segment to fit into it. I then drilled holes through the sticks at the end and sanded the sides of the sticks to give a little wiggle room at each “joint”. Next, I threaded a small bolt through each of the joint holes and superglued the inside of the nut. Once the bolt entered into the nut, it would remain attached, but would be loose enough to allow for the joint to move. The servo motor was then attached with the wires running to a microcontroller that I had programmed. The movement was controlled by a potentiometer that I had also wired into the microcontroller. Then I covered the segments with some of the foam I shaved off of the head. Krang looking like flesh involved spraying with about four coats of Plasti-dip, an aerosolized rubber substance that is usually used for auto repair, and I spray painting him pink. Overall, my estimates for total costume cost are between $400 to $500 for the supplies. Additional expenses for equipment such as a soldering iron, hot glue gun, etc were probably around $150. The construction of this costume took several months and took hundreds of hours. I didn't know anything about micro circuitry, programming a micro-controller, or the function of servo motors before undertaking this project. Lots of hours watching YouTube and trial & error allowed me to build something that not only looks pretty cool, but also moves and lights up!